On May 29th 1998 the present Club site and buildings were purchased outright from the UKAEA for £203,000. This purchase was only possible due to the sponsorship provided by the Sports Council using National Lottery finance. The sponsorship funding amounted to about two thirds of the cost and the remainder, some £65,000, was obtained from Club reserves and loan facilities. Although there are “claw-back” clauses in the contract to prevent the members from selling out at a profit, the Club now belongs to its members. Unlike our predecessor – the DATEN Sports and Social Club – Culcheth Sports Club has no membership restrictions of any kind. The Club is now open to all. All that is recent history, but our roots do go a little deeper, and you may be interested to learn how the DATEN Club itself came into existence. It all began in 1946, when the Ministry of Supply formed its Division of Atomic Energy which located its Industrial Group Headquarters at Risley in some existing ordnance factory buildings. The task of this Group was to harness for peaceful purposes, and specifically for the generation of electricity, the unlimited power source provided by nuclear fission. Civil servants were transferred from Ministry of Supply, Ministry of Works and other Government departments to meet the needs of this fast growing project, and these staff were soon augmented by further recruitment. This was at a time when there was a great shortage of housing. The main living accommodation for these staff and their families was in the Culcheth locality in temporary war time huts at the Newchurch Hall and Little London sites, and in early post war single storey pre-fabricated homes in Culcheth. The present Taylor Industrial Estate and new housing occupy all these sites nowadays. There was little by way of local recreational facilities in the area, but fortunately the Newchurch Hall site had inherited tennis courts, a large recreational hall with a cinema and a stage, and ample space for badminton, dances, etc. In addition there was a bar and the Little Theatre for plays and smaller functions. Football fields in the area were soon provided by a grant from the Civil Service Sports Council (C.S.S.C.) to whom all the ‘atomics’, as they were called by the locals, contributed by payroll deduction. The DATEN Sports & Social Club, which at that time catered solely for the Division of Atomic Energy staff, was soon formed and fully operational at the Newchurch Hall site by Summer 1947. As soon as new housing became available, the UKAEA (as the Division of Atomic Energy had then become) were able to close the temporary married accommodation in Culcheth and offer to relocate the residents in new rented properties, which many eventually purchased. A new 180 bedroom hostel, which became known as Culcheth New Hall, was built in Church Lane and the recreational facilities at Newchurch Hall were run down. Culcheth New Hall ceased to operate as a staff hostel in the 1980’s and has now been converted into private flats. Part of the disused naval establishment HMS Ariel West site, which was adjacent to the proposed hostel location, was acquired by the UKAEA after a meeting on 8 October 1956, with a grant of £15,000 from the Central Recreation Committee (successor to the Civil Service Sports Council). This site had a recreational facility building similar to, but smaller than that at Newchurch Hall, and this building is the core unit of the present Club. During, and for a short time after the war, HMS Ariel West was a naval camp, and the present Main Hall of the Club was a gymnasium as well as being used for social functions and dances. 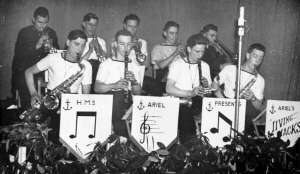 The photograph below shows a dance band playing on the Main Hall stage in 1947, well before discos were invented! The Ariel Lounge in the Club provides a reminder of these war-time connections and the Coat of Arms of HMS Ariel is on display there. During the period 1956-58, arrangements were made for formal disassociation of the DATEN Club from the CSSC, and the Club re-opened at its present site on 3 July 1958, with a formal opening by Sir Donald Perrott. At that time the membership was opened up to all the local residents within a fixed radius from the Club, although the UKAEA staff members retained management control. For many years, until 1998, the proportion of non-staff members had to be kept below a fixed fraction of the total membership at the behest of our Landlord, the UKAEA, who owned the site and buildings. For 40 years, the DATEN Club operated under a licence agreement with the UKAEA and was, in operational terms, self financing. A very favourable renting agreement with UKAEA, who also accepted responsibility for the rates and building insurance and maintenance, did however represent a significant subsidy to the Club. Latterly BNFplc shared these support costs and also provided grants for specific projects. The DATEN Club was responsible for the maintenance and decoration of the inside of the building, and for the sports facilities outside. Prudent management over the years enabled the bar lounge and the bars themselves to be more than doubled in size, a large annexe, stores and groundsman’s facility to be built on to the Hall, and the provision of another smaller lounge, table tennis room, billiard room and a games room. Tennis courts were enlarged and resurfaced, and a cricket pavilion erected. The cost of all this extensive building and modernisation was met out of Club income. Culcheth Sports Club now operates as a completely independent and self financing body, which must meet the challenges and demands of the future completely from its own resources. Provision of high quality sporting and leisure facilities at a competitive charge is a demanding task for any members Club, and requires both the support of, and the active and effective participation in Club activities by, the membership at all levels. The rundown of the staffing levels in the nuclear industry has, in recent years resulted in a decline in the total membership, but this has been offset by an increase in the number of ‘non-industry’ members who appreciate the benefits of having a local community sporting and leisure Club close at hand.